When Joytime Ministries began, Joy had the logo designed with a red flower. Red represents the blood of Christ and red is Joy’s favorite color. That changed after Joy learned of C.S. Lewis’s autobiography, “Surprised by Joy”. 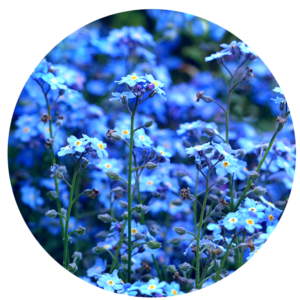 In his book, Lewis references the votary of the Blue Flower when writing about his childhood. When he was six, Lewis sat in his school classroom and saw the Castlereagh Hills from his classroom window. Those hills were unattainable to the children in the classroom, and they taught Lewis what it means to “long” to be in another place. Each of us have a longing deep inside. God has set eternity inside the human heart. It is the longing we have to leave the cares and stresses of the world for a better, perfect place. We long for a place with no pain. We long for a place with no suffering. We long for heaven. We long for God. The blue flower is a symbol of what is to come, but is unattainable right now. A place where there are no tears, no fear, no pain, no suffering. The blue flower is a symbol of hope. It is the hope that Christ represents. It is the hope we have of spending eternity with Him! Thank you for the explanation and application.